When a Benedictine sister at a St. Leo, Florida monastery wanted to do more in helping feed the hungry and heal the world, she did something a bit unexpected: she started an onsite aquaponics system. Prior to this endeavor, Sister Miriam Cosgrove’s knowledge of aquaponics did not extend far. So last March, she sought the advice of experts at Morning Star Fishermen, an international aquaponics research and training center in nearby Dade City. But there were still other hurdles to jump. First was the issue of funding. Second, the City of St. Leo wanted Holy Name Monastery to acquire a permit to start construction. This led to Cosgrove having to educate city officials about what aquaponics entails. Finally, Cosgrove was worried that the monastery’s other sisters might not be as enthusiastic as she was about taking on such a serious project (not to mention that those at the monastery knew little or nothing about aquaponics). In the end, the sisters gave their blessing. “It was very energizing that they wanted it,” Cosgrove says. By October 4 of 2014, everything was approved to move forward. But the construction process for the new facility posed its own challenges, and Cosgrove and her sisters still had a lot to learn. The system consists of 10 250-gallon tanks full of tilapia. Plants include lettuce, tomatoes, basil and cilantro. The sisters at the monastery are already benefiting from the bounty, and the aquaponics operation is attracting interested visitors. In February, two priests, both named Father George, visited the monastery and its aquaponics facility. One priest is from Cameroon, the other from Brazil, and both were excited about the possibility of starting similar projects in their countries. Cosgrove is among the learners, and she appreciates the personal growth she has gained by acting on her desire to learn about aquaponics. “Fish farming is a new adventure. It has changed my life,” she says. For as long as Cosgrove can remember, she has appreciated St. Francis of Assisi (her father and brother were both named for St. Francis) and his love for creation and Earth. The people at Morning Star, she says, did not only teach her about aquaponics, but about sustainable living. Now, she views the monastery’s new aquaponics operation as an outgrowth of faith. Additionally, Cosgrove views the monastery’s new food source as a great way to feed the world’s hungry. 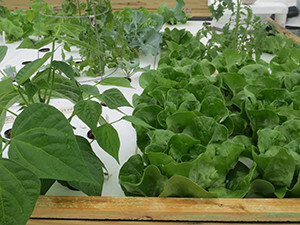 Until recently, Cosgrove was the sole operator of the aquaponics facility (with some volunteer help from students at adjacent Saint Leo University). But things have been going so well that she now has hired help. Future goals include growing papayas and moringa fruit, and producing a DVD explaining why the monastery has embarked on this new adventure. “It’s getting to be pretty routine, but we’ve only just begun,” says Cosgrove, alluding to the song by The Carpenters.